Hi - I'm Max, and I'm adopted. You may not know this but many famous and inspirational people were adopted too. 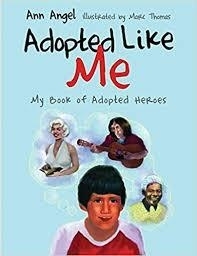 Adopted Like Me introduces you to great musicians like Bo Diddley, politicians like Nelson Mandela, and stars like Marilyn Monroe. Meet these along with inventors, athletes, and a princess skilled in judo and fencing - all of them adopted like me. Read about these adoptees and you'll see that you can grow up to be just about anything you want to be! Fully illustrated in color, this book is for children aged 8+ who have been adopted, their parents, teachers and siblings.